Sometimes they tell you. Sometimes they don’t. But one thing you can assured of, 007’s watch will have some fancy gadgetry included. This particular effort includes a powerful laser, with which Bond is able to burn an escape plan through a train. It is also used to set off strategically placed mines if you intend to blow up plants, power stations or baddie’s lairs. 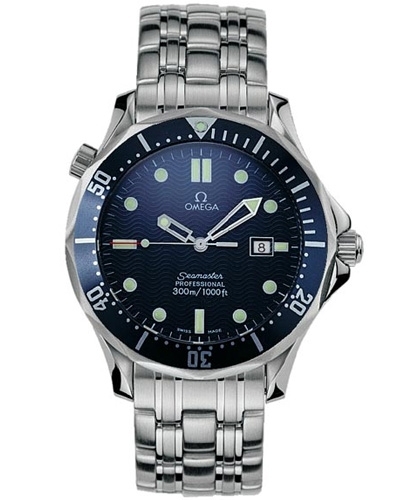 James Bond moved away from Rolex (Ian Fleming's brand of choice for his character), in Goldeneye, in favour of the Omega Seamaster Professional Diver, which would be worn by Pierce Brosnan in all of his James Bond movies. The model is a Professional 2541.80 Quartz, stainless steel full sized with blue face, blue bezel with a stainless steel bracelet. 007's former buddy and colleague, Alec Trevelyan, who was 006, wore the same watch but with a black leather strap.